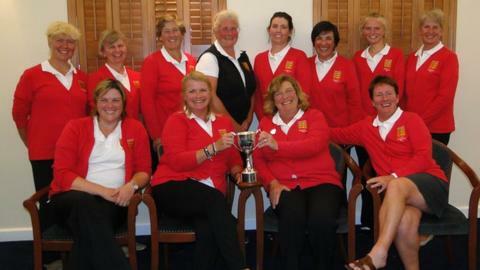 Jersey have beaten Guernsey 11-9 in the first ever women's golf inter-insular at L'Ancresse. Jersey had led 6-4 after the opening day of foursomes and fourballs and held on through Wednesday's singles. Aimee Ponte, Kay Mapley and Mandy Webber got Guernsey off to a good start but Jersey replied with wins from La Moye's Jenny Deeley and St Clement's player Helen Lagadu. "We didn't expect to win in Guernsey," said Jersey manager Juanita Adlington. "Conditions were tough and I think it took away from their home course advantage. "It was a really good win for the team but it was very tight and very nerve-wracking." They follow Jersey's men in beating Guernsey in the inter-insulars after they eased to a comfortable 13-7 win in the annual Challenge Trophy. The women's match is set to next be played in Jersey in 2014.